What Day Of The Week Is December 28? 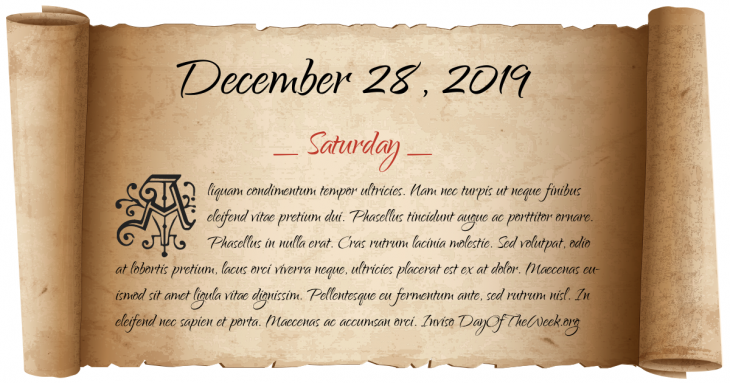 December 28, 2019 is the 362nd day of the year 2019 in the Gregorian calendar. There are 3 days remaining until the end of the year. The day of the week is Saturday. Here’s the December calendar. You can also browse the full year monthly calendar. John C. Calhoun becomes the first Vice President of the United States to resign. South Australia and Adelaide are founded. Iowa is admitted as the 29th U.S. state. United States claims Midway Atoll, the first territory annexed outside Continental limits. The Tay Bridge Disaster: The central part of the Tay Rail Bridge in Dundee, Scotland collapses as a train passes over it, killing 75. The DC-3 airliner NC16002 disappears 50 miles south of Miami, Florida. “Greatest Game Ever Played” – Baltimore Colts defeat the New York Giants in the first ever National Football League sudden death overtime game at New York’s Yankee Stadium. The Endangered Species Act is passed in the United States. U.S. retail giant Montgomery Ward announces it is going out of business after 128 years. Who were born on December 28?